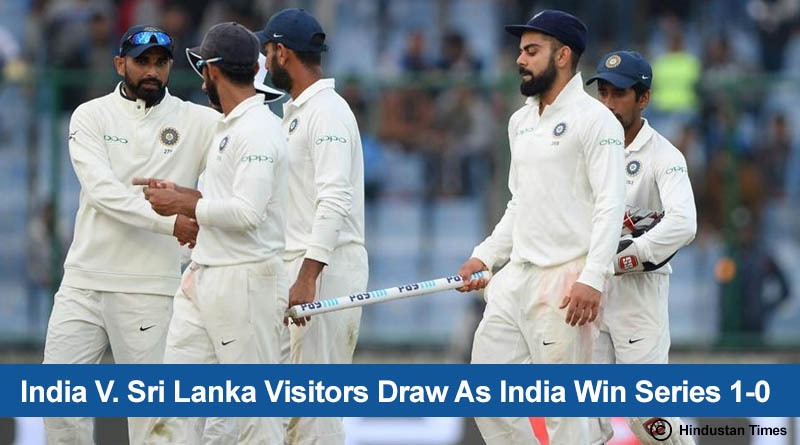 India continued their supreme dominance over a poor Sri Lankan cricket side in recent years once again as they lifted the Paytm Test Series trophy at the Feroz Shah Kotla Stadium. With two of the three test matches in the series ending in draws owing to bad playing conditions, India went on to win the second match to take home the series 1-0. Even in the two draws, India were on the brink of victories. They rightly won the series having trashed Sri Lanka in all three departments of the game throughout the series. Coming out to bat on Day 5 India needed 7 wickets to register another win against the visitors. And it looked like another defeat was certainly on the cards for Lanka as they went on to lose an early wicket in the first session of play. From then on they commenced with their antics of the past few days as they kept complaining about the bad air and light conditions to halt up play again and again .The situation got so out of hand that the umpires had to intervene, asking the Lankan batsmen to retire if they couldn’t cope with the conditions but to stop wasting time. Despite session 1 being shared by both countries, Sri Lanka took home the remaining sessions of the day as they dug through on a batting friendly pitch to draw the match. Roshen Silva (74) and Dhananjaya De Silva (119) batted well to save the Sri Lankans from another embarrassing defeat. Despite throwing everything at them with even Kohli and Vijay taking up the ball for a couple of overs, India were unable to break through the defences of these two players who negotiated the Indian bowling comfortably. They guided Sri Lanka to 299-5 at the close of play on Day 5 which was enough to save the test match but not the series which the Indians took home 1-0. With the series win India went on to equal the record for the most consecutive test series wins in international cricket. They now face the visitors in an ODI series with Rohit Sharma taking over as captain from Virat Kohli who has been given a much needed rest.